The good thing about the bomber jacket is in the variety of choice. The are so many colours, materials, styles you can choose from and not forget that it is wearable with so many things whether it is with a pair of jeans and heels or a classic pant with sneakers. The choice is yours. What do you wear with your bomber jacket ? Bomber jacket is still in trend though and will look good with a good pairing. With our weather down under, I would pick the military look which is number 6. 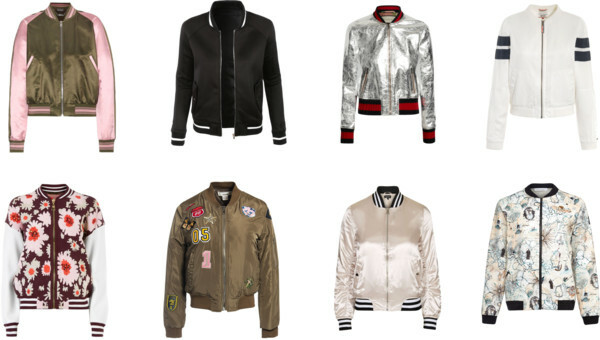 Gucci and Sans Souci Patch bomber jacket are my favorite! I ´m so in love with bomber jackets! Love the pink one from topshop. Bomber jackets are perfect for Spring and these are some great picks! I love to layer with them! Bomber jackets are such a cool trend! Big fan of bomber jackets. And great choices. They are so cool. I definetely need one!! I must say, I'm currently obsessed with bombers too! Great selection.